Sew Joy: A Canadian Hostess For Canada Day! A Canadian Hostess For Canada Day! Tong is a member of the Canadian Sew Modern Bee with me. 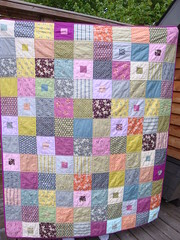 I love her Hope Valley quilt! (and salivating over!) every week. She takes great photos, too. Her blog is a visual treat! Enjoy your visit with Hostess Tong at tingtongandthings! I have the links from each Hostess on the Grand Prize Post.